Bingers, are you ready for two weekends of Original Pinoy Music? Brace yourselves because this year, for the first time ever, BGC Arts Center will launch a landmark festival made possible with the support of Sun Life Foundation. Bingers , get excited for Pinoy Playlist 2018: Ito ay Atin, Sariling Atin. It will be the first on an annual Music Festival curated by Maestro Ryan Cayabyab, Moy Ortiz, and Noel Ferrer. No matter what genre you are into, you will definitely have fun here! Pinoy Playlist will revive the tradition of Filipino music by exposing the breadth and range of Filipino musicality across time. Various vocal groups, solo, bands, classic, indigenous, pop, and even collaborations from different artists are set to perform at the music festival. There is no doubt that Filipino music from across generations will shine throughout the festival. Pinoy Playlist 2018 will see over 1o0 Filipino musicians and production teams who finely tuned into the idea of it and contributed in it. Among the long list of performers on the two-weekend event are: Gloc-9, Pedicab, Ben&Ben, Shanti Dope, and Moonstar 88. Bullet Dumas will serenade you at Pinoy Playlsit 2018. Sing-along to the hits of Moonstar 88 at Pinoy Playlist 2018. For a big event such as this one, great minds have to work on it. 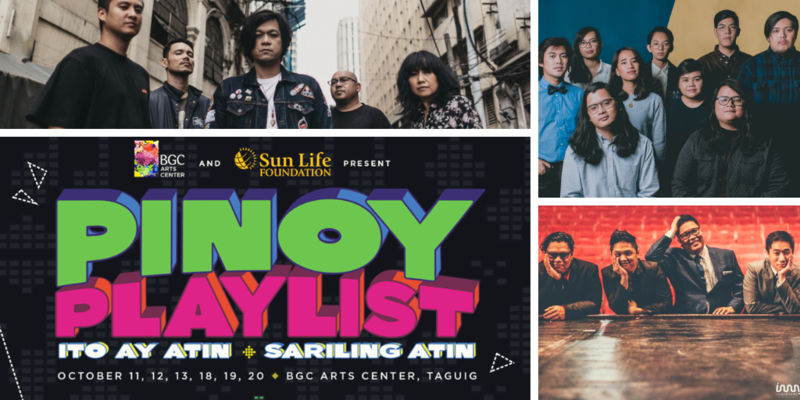 Pinoy Playlist 2018, Ito ay Atin, Sariling Atin is a labor of love of the Pinoy Playlist curators off whom the BGC Arts Center is proud to be working with. With that said, let’s get to know them. Maria Isabel Garcia, Head of Content of BGC Arts Center, gives credits to those who care for Pinoy music with their lives. She adds that the BGC Arts Center is passionately committed to create and celebrate Filipno stories of creativity and there is nothing like music to inhabit those stories. NEXT POST Next post: SunPIOLOgy Turns 10 and Amps Up The Challenges!